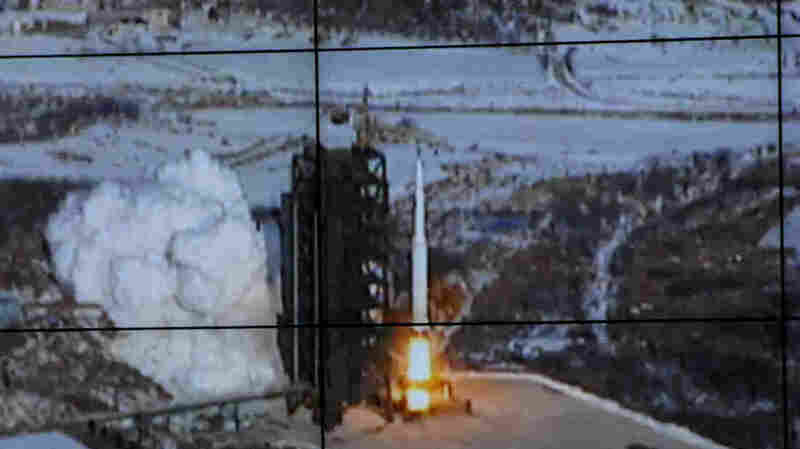 What North Korea's Rocket Launch Means — And What It Doesn't : The Two-Way Although North Korea claims the launch was a scientific endeavor to put a satellite in orbit, the U.S. and its allies were quick to call it a long-range missile test. That may conjure up visions of nuclear missiles, but strategy experts say such technology is still out of reach for Pyongyang. North Korea's successful rocket launch may conjure up visions of nuclear missiles in the hands of one of the planet's least predictable regimes. But building a satellite launch vehicle doesn't directly translate into an ability to rain warheads on distant enemies. Pyongyang still faces major obstacles before it can claim to possess reliable, nuclear-tipped intercontinental ballistic missiles capable of hitting its Asian neighborhood and much of the Pacific basin, including Alaska. By launching the three-stage Unha-3 rocket into orbit Wednesday, "the North has crossed a major threshold in terms of mating an ICBM with a nuclear weapon," Victor Cha, who holds the Korea Chair at the Center for Strategic and International Studies, writes in a Q&A for the think tank. Cha says the Unha-3 has a range of possibly 4,000 to 6,000 kilometers. Some estimates put it closer to 10,000 kilometers, which would put much of the Western United States in striking distance. While North Korea might have the reach, it still faces the problem of perfecting a nuclear warhead — a much larger obstacle than simply exploding a nuclear device, which North Korea first accomplished in 2006. "The North Koreans have demonstrated some of the capabilities they would need to have in order to develop an ICBM," Greg Thielmann, a senior fellow at the Arms Control Association, tells NPR. "But that doesn't mean that they are ready to build one." Warheads need to be relatively small, able to withstand the intense heat and vibration of re-entry, and land on — or at least near — their intended targets. "They are not there on the nuclear end and would have to have many more tests to have enough confidence that they have a reliable mode of delivery," says Jim Walsh, an expert in international security and a research associate at the Massachusetts Institute of Technology's Security Studies Program. "You need reliability. If you shoot one, you better be pretty confident it is not going to malfunction, hit your own territory and explode." Thielmann agrees that producing a useful warhead is fraught with difficulty. "Based on the testing we've seen and some other assumptions about North Korean abilities, we don't think they're ready to arm an ICBM with a nuclear warhead yet even if they had an ICBM, which they don't yet." Then there's the fuel problem. Unlike most ICBMs, which run on solid fuel, the Unha-3 is powered by liquid fuel, which can't be stored for long periods inside the rocket, Thielmann notes. Liquid fuel rockets have other drawbacks, too. For starters, they are "really too big and too unwieldy to move around," he says. "So, it's a stationary target. Any stationary target is going to be vulnerable to pre-emption." In other words, if it looks as though North Korean leader Kim Jong Un is planning an attack using an Unha-3 type of missile, Washington might become aware of the preparations in time to destroy it on the launchpad. Walsh concurs: "Liquid-fueled rockets sitting on the ground for hours are seen as being vulnerable to strike." While North Korea isn't at the ICBM stage right now, Cha of the Center for Strategic and International Studies cautions against underestimating that threat. "I think there's a natural tendency to discount the North Koreans as being these crazy people who are not successful in terms of their technology," he tells NPR. "But I think there needs to be greater attention paid to the strategic significance of what they've done. "There are still other technological thresholds they need to cross to target the U.S. with an ICBM warhead," he says. "Still, it's only a matter of time before they are able to do that, as this test shows."